More homeowners are weatherizing and sealing against drafts to save money on utility bills, increase comfort, and be more environmentally friendly. At the same time, a draft-free home can have issues that a drafty home does not. 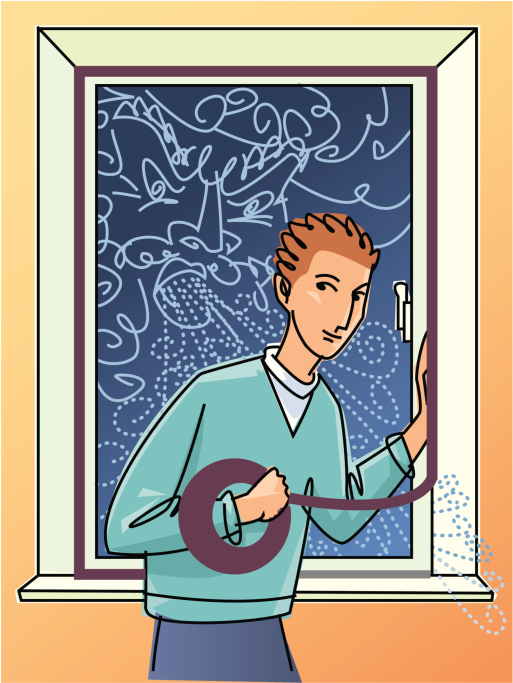 An air-tight home can collect humidity and air pollution and cause health issues because of stale air. The good news is that poor indoor air quality can be reduced by using an air exchanger. An air exchanger solves the problem of poor indoor air quality in a well-sealed home by bringing fresh air in from the outside so the inside humidity is reduced and the air quality improves. Of course, just opening some windows would do the same thing. The difference is that an air exchanger captures the heat from the air that is leaving your home and transfers that heat to the fresh air entering your home. We get the benefit of fresh air without the heat escaping. An air exchanger takes advantage of the natural tendency of heat to spread to cooler places. The main idea is to bring the inside and outside air close together inside the air exchanger so they are separated only by thin material. The inside and outside air do not mix, but the heat is transferred from the outgoing air to the incoming air as they pass each other. Air exchangers do use some power, since they usually have two small blowers. One small blower moves the inside air through the air exchanger to the outside. The other moves air from the outside through the air exchanger to the inside. These blowers use very little electricity and are comparable to having two lights turned on. This small amount of electricity is worth the benefit of better air quality and better controlled humidity. An air exchanger improves the air quality because fresh air helps to reduce excess humidity and indoor air pollutants. Indoor pollution includes radon, mold, moisture, secondhand smoke, indoor wood smoke, environmental asthma triggers, pesticides and household products. Materials used in the building can include asbestos, formaldehyde, and lead. High humidity can make these indoor pollutants worse. 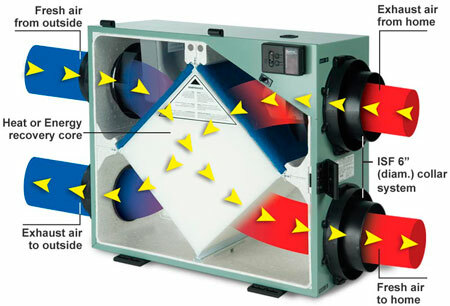 An indoor relative humidity range of 40–50 percent is considered ideal. A drafty home will become very dry indoors because the indoor humidity is carried outdoors and winter air is usually drier than summer air. The relative humidity of a well-sealed home can easily rise well above 50 percent. Some common sources of humidity are showering, cooking, doing laundry, dishwashing, and even breathing. It does not take much water to have a big impact on the indoor relative humidity. High indoor humidity can be a problem because it increases the chance of condensation, which encourages mold growth and respiratory issues. In places where warm, moist air is close to cold outside air, condensation is most likely to occur, because as the warm air is cooled, it releases moisture. 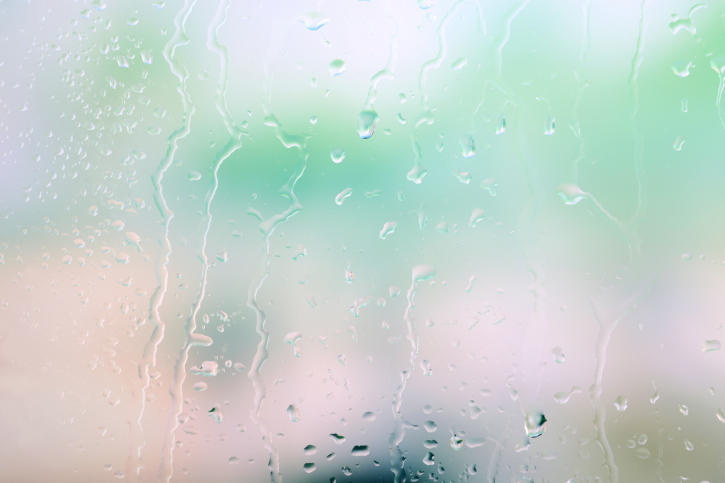 Reducing the relative humidity reduces the amount of indoor condensation. Studies have shown that a relative humidity of 40–60 percent reduces the effects of many health problems. Contact us today for a free, no-obligation quote for an air exchanger installation. Air exchangers can be installed in homes with forced air heat systems as well as other heat systems.